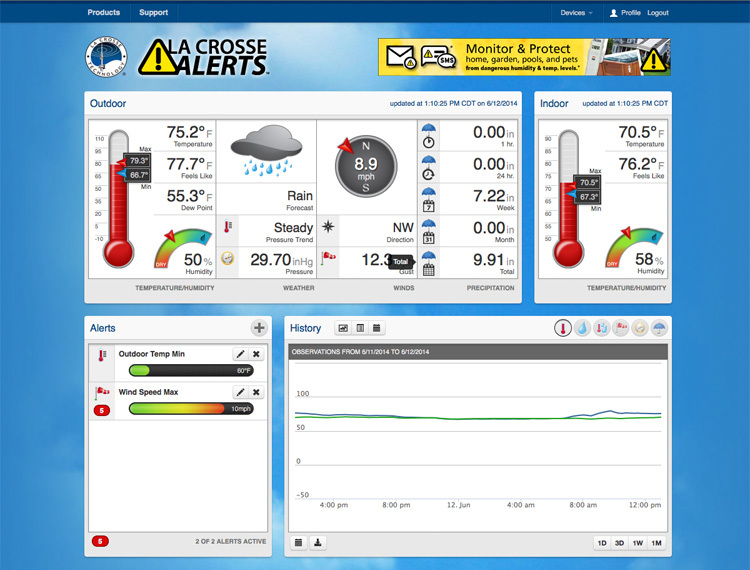 The Lacrosse Technology projects, Weather Direct and La Crosse Alerts, allows users to monitor and receive alerts based on environmental information gathered from both external sensors and weather data from HAMweather’s Aeris Weather API. The API streamlines weather and alerts effectively and smoothly. These products offer the ability to provide the user with real-time monitoring and forecast information delivered to them via website or on their mobile devices. Weather Direct and La Crosse Alerts were projects originally designed around an alternate proprietary weather data provider. This meant that moving to HAMweather required projects to be rewritten in order to use the new HAMweather Aeris API services. The main challenge for La Crosse was becoming familiar with the new API and updating legacy software quickly to minimize any potential impact to the Weather Direct and La Crosse Alerts customers. The forecast and alert engines for Weather Direct and La Crosse Alerts were rewritten to use HAMweather’s Aeris Weather API for their devices. The weather API provided the means to complete the project within budget and in a timely manner without negatively impacting the existing customer base. The implementation of the Weather API services replaced the legacy data provider smoothly and successfully and is now providing a more streamlined and more accurate weather and alerting system for La Crosse customers. The HAMweather team was great to work with and very helpful whenever I ran into a blocking issue or just had a general question regarding use of the services. Their response to issues was timely and informative. The documentation made it easy to learn the API and quickly determine the best ways to integrate the system into existing codebase. What I wasn't able to parse from the docs was always answered by the guys at HAM. La Crosse Technology, founded in 1985, is a multinational company with a small-town philosophy of servicing the customer to the highest level. The consumer electronic products include radio-controlled clocks and watches, wireless weather stations, power monitors and other measuring devices. They first introduced radio-controlled clocks to the US market in 1991 and continue to be on the cutting edge of this technology in America. La Crosse Technology products are available for purchase at thousands of retail establishments across North America.